The way in which a sample is held or presented will directly influence the accuracy of results generated. Forces are commonly manipulated with test accessories to replicate consumer handling or consumption. It is also important to secure or present the sample to the instrument as reproducibly as possible. 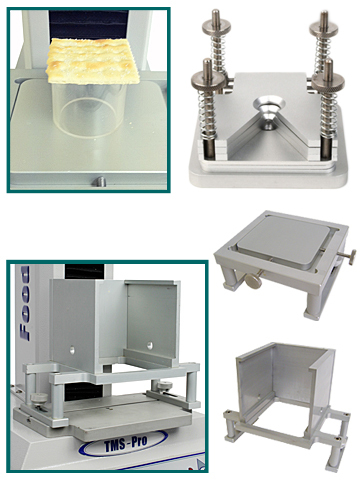 The FTC sample presentation fixtures are specifically designed to accommodate irregular shaped samples or containers. These fixtures prevent sample movement during testing, allowing accurate calculation of characteristics, such as adhesiveness, where it is critical that the sample remains firmly in place during the return stroke of the texture analyzer. Once set up, the technologist can simply test sample after sample with the guarantee of central alignment between test probe and product. The TMS mini vice grip and 3-point bend fixture is also available for presenting small samples, such as tablets, for snap or penetration tests.